John Armistead talks with students at Edgewood Elementary School, Homewood, Ala.
John Armistead with students at Lake Stevens Middle School, Miami, Fla. Armistead was invited by the Miami Book Fair International to visit schools that had read "The Return of Gabriel." 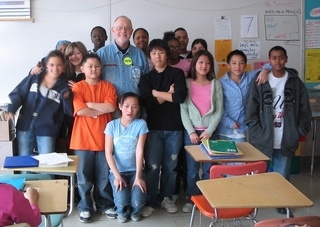 John Armistead and eighth grades students at Anwatin Middle School, Minneapolis, Minn. The students had read Armistead's book "The Return of Gabriel." 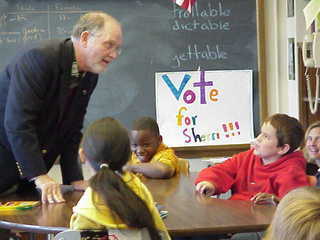 John Armistead and sixth grade students at Sheridan School, Minneapolis, discuss developing characters for a new story. March 15-17, 2019, Fairhope Arts and Crafts Festival, Fairhope, Ala.
May 11-12, 2019, Gumtree Art Festival, Tupelo, Miss. October 11-13, 2019, Pink Palace Crafts Fair, Memphis, Tenn.
A thirteen-year-old boy in Alabama visits his grandmother and learns about the violence of racism. A thirteen-year-old boy is caught up in the violence of Mississippi in the summer of 1964.